Modesty aside, this dish was a little bolt of vegan genius! 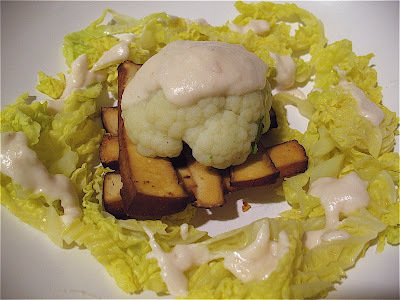 Baby cauliflower, over tea-smoked tofu, with Napa cabbage with a cashew cream-horseradish cream sauce. I've always loved cauliflower with cheese sauce, but when thinking of a vegan sauce to replace the cheese, horseradish with cashew cream seemed like a winner. And, if only you could taste what a winner it was right now! I steamed the baby cauliflower and cabbage for about 5 minutes. I sauteed tea-smoked tofu in EVOO until lightly crisped. I made the sauce with a 1/2 shallot sauteed in EVOO, with 1/4 cup cashew cream and about a teaspoon each of horseradish and sake. I used water to get the right consistency. 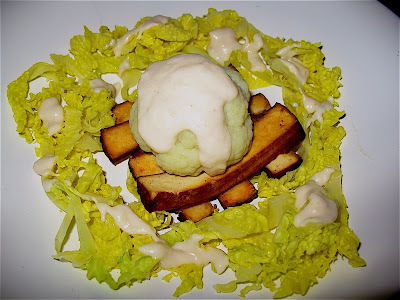 I put the cabbage around the plate, built a little base of the tofu strips, topped with the baby cauliflower, and then spooned the cashew cream-horseradish sauce over the cauliflower and cabbage. The freshness of the vegetables, the smokey tea-flavored tofu and the indulgently creamy bold sauce made an incredibly tasty combination. The cashew-horseradish cream would make a delicious sauce for any root vegetables! Swap the sake for white wine! Chris - it's sooooo easy and the perfect vegan solution to white sauce! Anna - thanks - it was! 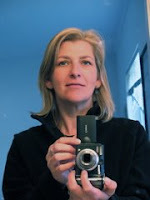 Emily - thank you! So easy and satisfying - so next time!